This page describes the last step of the New Task Wizard. 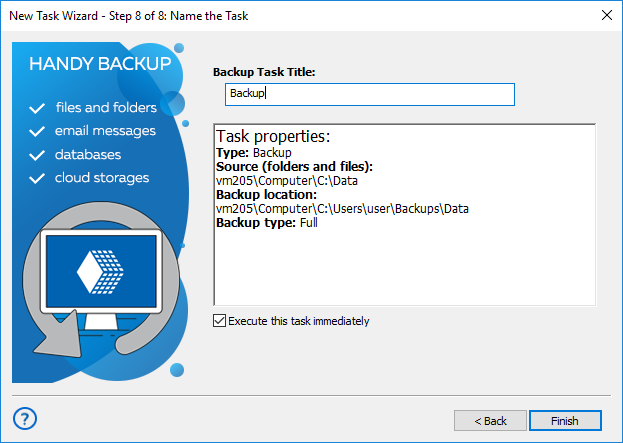 This step is similar for all types of tasks: step 8 of backup task, step 5 or 6 of restore task, and step 6 of synchronize task. Name the task. It is recommended that you give meaningful names, so you can then easier track overall status of your data. Review task parameters. If some you want to change something, you can go to the previous steps and do it. Check Execute the task immediately to run the task straight after you click Finish. You can start any task at any time in a manual mode, regardless of existing schedule for this task. To start any task you want, please do the following sequence of actions. In the Task View section of a main window, select a task (or multiple tasks) that you are planning to run now. Note: You can use standard Windows selecting tools (i.e. Shift and Ctrl keys in a combination with mouse left clicks) to select groups of tasks easily. When selected, click on an execution button on the Management Panel, or select the "Execute" item on the context (right-click) menu. 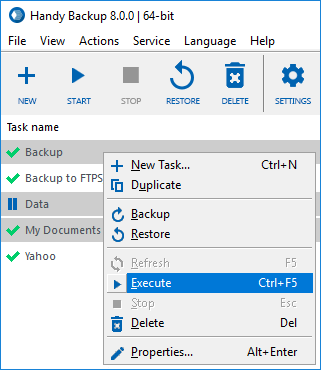 (You can also just press Ctrl+F5 to run selected tasks).